The Short Version: Instead of swiping based on looks and a guess of what you might have in common, Clover allows users to flesh out a complete profile to help sort through singles in more detail, including body type, religious views, education, and the things you enjoy most in life. This full-featured app was created to get users to the first date more easily with group chats based on mutual interests and on-demand dating, which finds a match for the time and place users specify. Clover, which was recently named “Best New App” by Apple and has a 4.5 rating on iTunes, and its high-quality digital experience translate to more dates IRL. We can probably all agree that the purpose of online dating is to help us get to the real thing — finally sitting across from someone new who piques our interest. We can flick through profiles and check boxes of our likes and dislikes in search of instant attraction, but does it actually land a date with the person on the other side of the screen? On the other hand, when we meet people organically, we can spark a conversation more easily than when we send a typed message. At a party, we can ask about mutual friends; in class, we can ask what they’re studying in school; while at the dog park, we can ask about their pet. Leading with something in common, while not the basis of compatibility, does help to create an instant connection that’s difficult to mimic online. 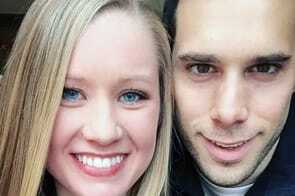 Lindsey used Clover to drill down on her dating preferences and found Mark. The game-changing features include Mixers and Dating On-Demand. The forum-like Mixers allow users to group chat based on mutual interests like they would in real life, while Dating On-Demand helps find users a date for a specific time based on its proprietary algorithm. Recently, Isaac Raichyk, CEO of Clover, shared with us his motivation for creating the top-rated Clover app and how its high-quality digital experience translates to actually meeting for a date. Isaac Raichyk created Clover to fill a void he saw in other dating apps. He explained that Clover offers advanced compatibility filters from an extensive database (e.g, higher education institutions, occupations, astrological signs, and physical attributes) to help members drill down and find someone special. You can also add interests from the Mixers topics, and the filters you set help drive the on-demand dating service. With over 1.5 million users to care for, Isaac said his team is focused on the functionality of Clover’s tech. All 18 employees know how to code — even the marketers — and that focus on the user experience has been a major contributing factor to the app’s growth. While you can still browse and match with people nearby as you would with a traditional dating application, Clover developed an On-Demand Dating service to help singles quickly meet someone offline. And with Clover’s Mixers, users are able to meet new people in a group setting based on shared interests. 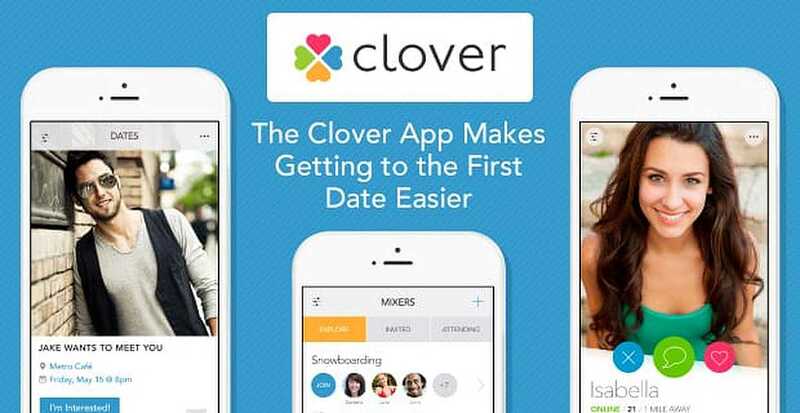 Clover combines the best features from today’s popular dating apps into one package. Unlike other apps, though, there are zero limits on profile views, messages, and matches — you can even review those you’ve accidentally passed on. The app also allows you to fine-tune your settings to browse nearby or ignore your GPS signal to search through profiles in other locations, which is especially useful when you plan to travel. You can sort through nearby singles, flesh out a detailed profile for more accurate matches, and communicate as much as you want before deciding to date someone you find on the app. A blend of Reddit and Meetup, Mixers provide a place for users to connect in a public forum. In a Game of Thrones Mixer, for example, users can propose a viewing party for nearby singles. Mixer topics, including fandoms, alma maters, fitness, and sexual preferences, bring people together. Clover analyzed the most popular Mixer topics in each state based on the activities of 1.5 million users. Mixers offer a place to get to know someone — or a few someones — more publicly and safely before matching and meeting. They also help singles plan fun, local hangouts based on mutual interests. On-demand service isn’t new, just look at the explosive growth of Amazon Prime and the shift to streaming video services like Netflix. Clover used the on-demand model to develop an innovative solution to conversations fizzling out before a date even happens. In two taps, Clover users can schedule a time and place for a date. Clover plays matchmaker, combing through its database to find someone you’d want to go on a date with then and there, based on traits like personality, physical attributes, dating intention, and reputation from in-app activity and feedback. Through Clover’s On-Demand Dating service, users can be matched for a date based on availability. Don’t worry, you still review your date’s profile before confirming, but the on-demand process helps ease the stress of actually landing — and planning — a first date. If you’re tired of reinstalling the same apps and firing off endless messages in the hopes of landing a date, then try to stay focused on the heart of dating — actually meeting for a date! Clover has made digital dating feel more like the real thing because users exercise complete control in the app with extensive filters and features like unlimited profile views. 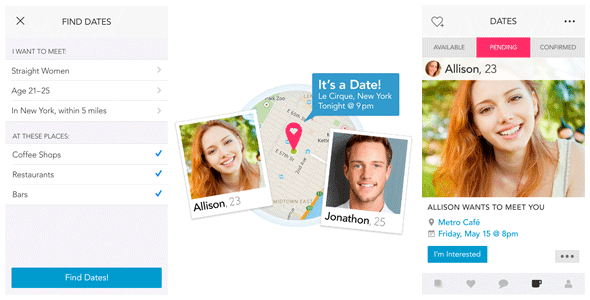 With their innovations in on-demand date planning and group chats, users get to know singles before moving to private messaging and meeting up. As the positive feedback suggests, meeting someone on Clover feels as natural as meeting someone at a friend’s party thanks to the mutual forums on Mixers and other dating iterations. 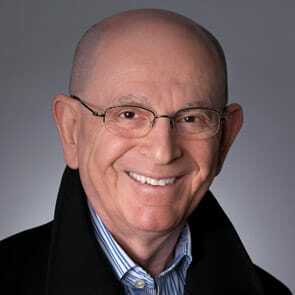 And Isaac wouldn’t have it any other way.